On the road to normal. I might not feel up to dealing with the intricacies of sewing a bodice right now, or messing around with the embroidery machine, or doing homework (sigh - glad my big paper got written before the surgery! ), or writing, but I am also tired of just sleeping and reading. Months ago, I bought some dupioni silk, with the intention of washing it, and making myself some cute summer tops from it. Washed, the silk is lightweight, but still has a very pretty sheen and a less stiff feel than unwashed. Me being me, more complicated projects *cough* quickly took front seat to my simple summer shirts. Well, yesterday I whipped out a pattern and some of that silk, and for the past two days when I've had the energy, I've been working on one. It helped me feel like I was doing something, without taxing either brain power or much of my physical energy. I finished it today, and I am so pleased with how it turned out. 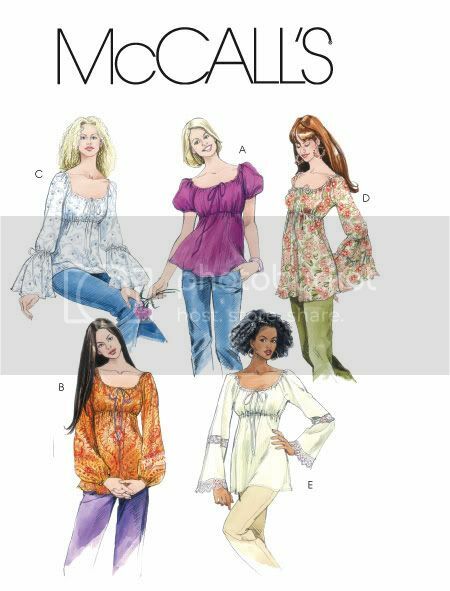 I used McCall's M5050, a simple 'peasant blouse' pattern. Me being me, I had to alter it slightly - I used the short sleeve version, but added ruffles to the sleeve cuffs. I used a color of silk dupioni called 'watermelon' - kind of that in between orange and pink color. I loooove how it turned out. Super comfortable, cute, and I adore the pretty fabric. The pictures don't quite capture the sheen of the silk, unfortunately. The front of the shirt. I made my own drawstring and 'belt' for the empire waist out of lengths of the silk, so it would match exactly. The back of the shirt. Pretty basic, ties in the back to give it shape in the front. And lastly, actually on me. I think I'll definitely use this pattern again, as it went together quickly, easily, and it's easy to make changes and variations to it. I feel good having accomplished something, and good finally using some of the silk I spent money on months ago. All in all, this top cost me about $30 to make. I think I might make a long sleeved version for fall. I've got some great green silk I'd love to use. SO PRETTY. MAKE ME ONE OMFG. I would love to make you one, Eliza! :) Just pick a color. The silk place I buy from has every color you can imagine (200+ and counting). Their website photos are not super accurate, but I have real life samples of all their dupioni, so if you sent me a color, I could match it, or come really close. also i love your icon, hi. how so awesome, rhien? Yes, totally! Without the belt is even faster and easier. 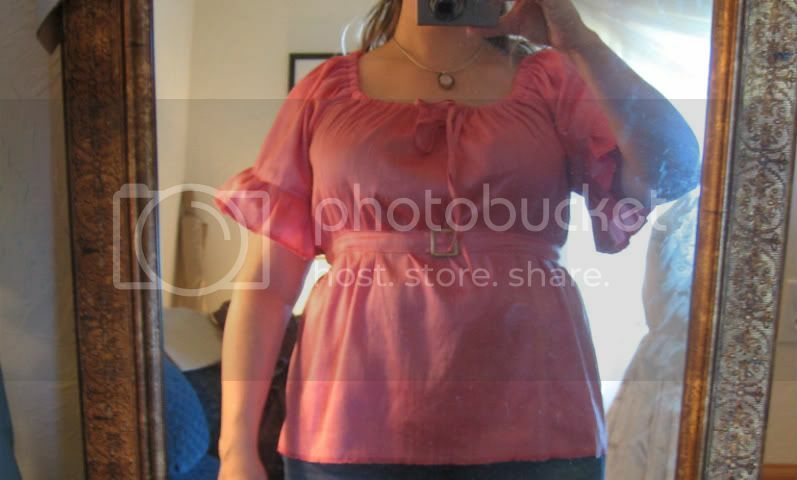 ~ What size shirt you normally wear, or even your US jean size. The package was pretty accurate for me re: my jean size/size of pattern to cut. 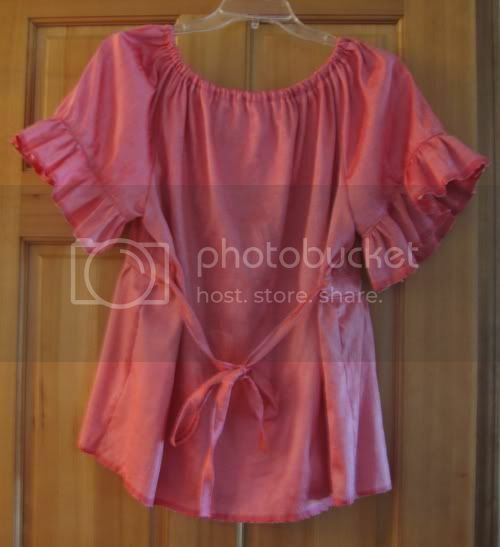 It's a peasant blouse with a drawstring neck, so these tend to run a tad large anyway, and be really size forgiving. ~ What kind of sleeve do you want? 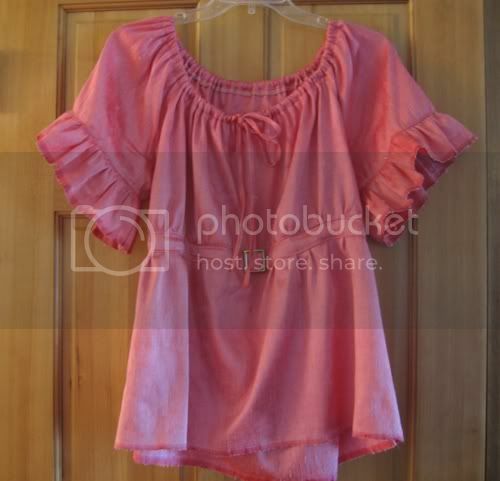 I can do just like you see, any on the package, or I could do a long sleeve w/the ruffles on the cuff. Oh, right - well, if wanted to browse colors, thesilkbaron.com under colors, handmade 54" dupioni. That is gorgeous--the pattern, the color and fabric, how it looks on you. It's just lovely! I thought I heard sewing when I was talking to you yesterday! Ooh, gorgeous color and I love how you put it together.